The Gowanus Lounge: Coney Island Mega-Focus #3: Circus Coming to Town? Are Coney Island developer Joe Sitt and Thor Equities trying to put a kinder, gentler face on their Coney Island project and dampen some of the controversy it has generated? Could be. 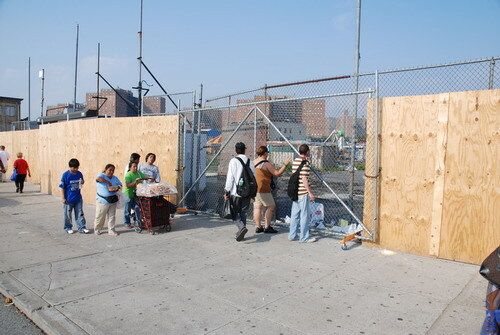 Today, they send word via the New York Post that one of the big parcels of land that they cleared over the winter and that is now surrounded by a big plywood fence, will be reanimated a bit during the summer. The Post reports that land on Stillwell Avenue will be getting a giant inflatable water slide and a 2,000-seat big-top circus tent. The circus will perform up to three times a day, but only from July 30 through August 5. There will also be a 40-foot-high by 120-foot-long water slide called "The Hippo," open from June 23 through Labor Day. Movies will also be shown on a big outdoor screen from Monday, July 9 through August 27. If you want to see more photos of what the area looks like right now, click here. Yesterday, there was a police car stationed on Stillwell next to the big fence watching the crowd, dumpsters overflowing with trash bags sat on the boardwalk end of the street, a few vendors sold bottle water, and a Mr. Softee Truck was doing a good business selling ice cream.